Out of Spring–back into Winter–snowing when we arrived! 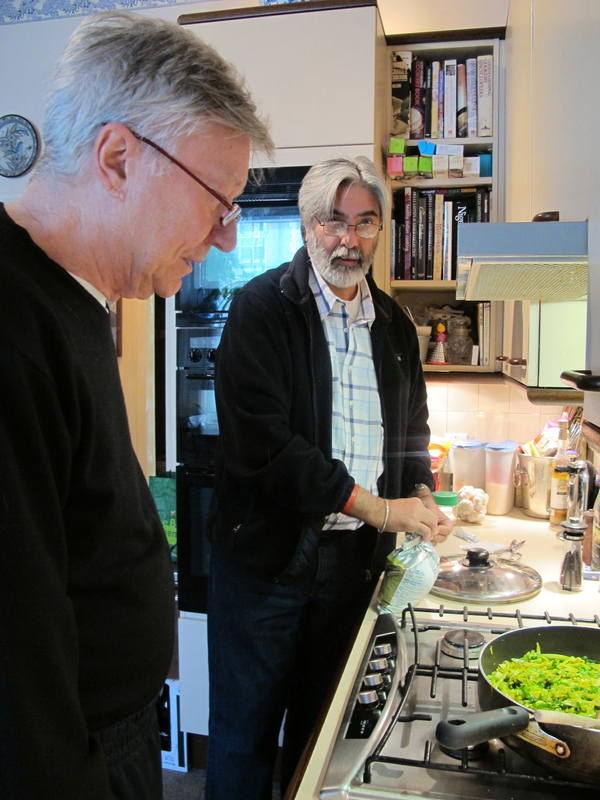 Our friend Tari–the carefree cook from Delicious Dishes–is cooking lunch and I’ve just watched him stir fry some cabbage for lunch to go with spatchcocked poussin. He heats the oil in a large sauté pan. Adds the cumin seeds and fries them briefly until they color a little. Adds the cabbage and turns it over thoroughly in the oil. Adds the spices and seasons it all with salt and pepper. 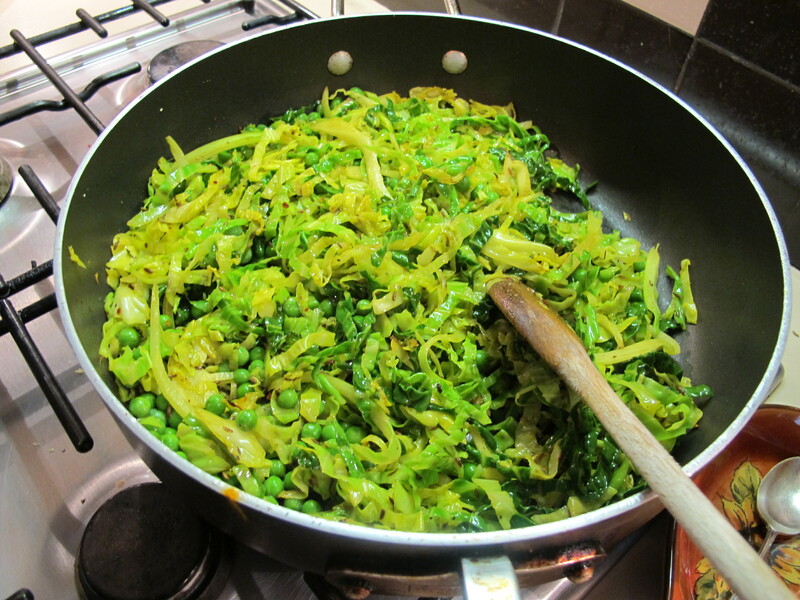 Tari says that if the heat is too low it will steam the cabbage and taste like hospital food!–and won’t pick up the little flecks of brown that add to its deliciousness–don’t burn it though!. 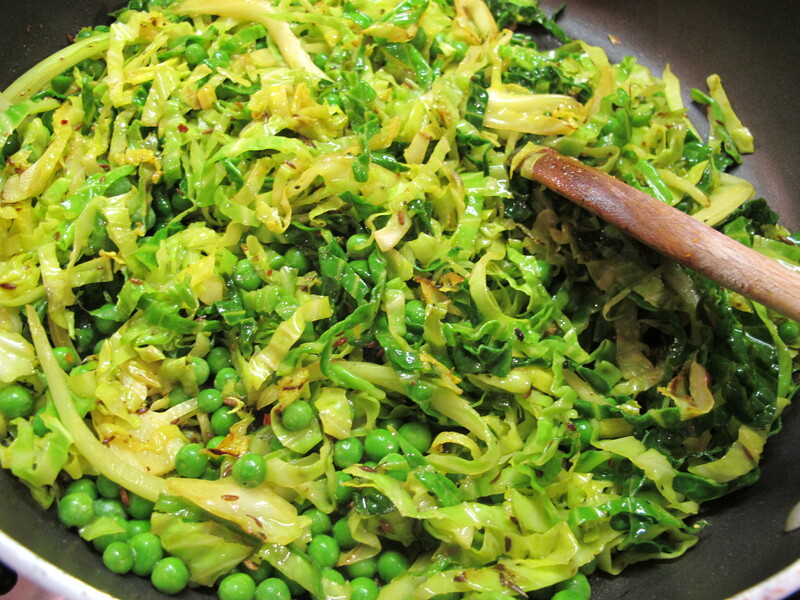 Then he adds the peas and turns them in and over with the cabbage. He likes to cook this a little ahead of time to let the flavours meld–then reheat it just before eating. It looking beautifully green and I can hardly wait! caramelised – the word you were looking for?? This looks and sounds delicious….will definately be trying this very soon! Thank you! Looks delicious! 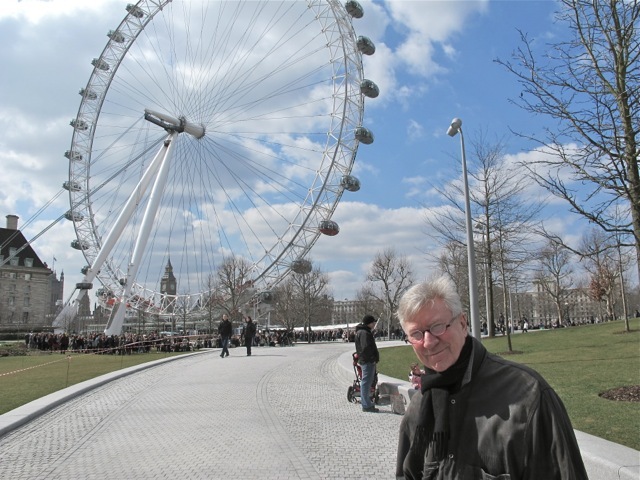 Wonder what section of London was that taken with the Ferris wheel precariously tethered? It’s amazing how simple ingredients can be so delicious. Is it just the photo…or was the dish really that vivid green? Or am I merely used to anemic cabbages? That vivid green is real! Scenery is great and the dish looks very healthy but also very good. Delicious! Thanks to you both! Here’s hoping you are well and having a good time in the UK. I’m missing your posts. Thanks for the message, Susan. We are fine. The reason for no posting is the deadline for my book–end of April. I am almost there! Then I’ll start over. Mr. Ellis, can I just ask you a quick question? In my storage cupboard, I’ve got some turmeric ,cumin seed, nutmeg and almond essences . Best before date has gone. How long after, are they safe to use? A month, two months or longer? Safe for a long time but their aroma and power diminish over time. I thought so. Thank-you for telling me. Good luck with your workshop there in France! on April 23, 2013 at 9:16 pm | Reply Dianne P.
Was wondering why we hadn’t heard from you…thought something was wrong with my email or perhaps you’d taken an extended birthday rendezvous with Meredith! 🙂 Glad to read you’re both fine! Keep us posted on the book! Yes I’ve spent the last two weeks at the “coalface” here or in London. It goes off to the publisher Tuesday. Thanks for wondering, Dianne! Does look delicious but I really dislike cumin so will subsitute another spice. Any ideas? Very best wishes for Tuesday – but watch the stress – plenty of cat stroking required just now! I came on the site to ask if you were keeping well because there have been no posts from you for a while!! Glad all is well , Robin. Glad you are well. Miss your posts. I just made this recipe and my entire family LOVED it!! Thank you, both, for the inspiration, and the treat to our taste buds.